Becoming an Outdoors-Woman (BOW) is an international program licensed mostly to fish and wildlife agencies in the United States and Canada. The BOW program has also recently expanded to Australia and the Bahamas. 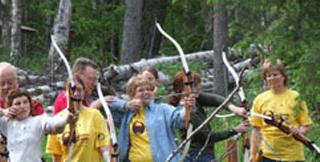 Becoming an Outdoors-Woman weekend workshops offer hands-on classes to introduce outdoor skills to participants. All classes are at the beginner level, geared toward individuals who have little to no experience in the subject matter. Workshop classes are broken into thirds: One-third shooting and hunting; one-third fishing; and one-third other outdoor skills, many of which are useful in the pursuit of hunting and fishing adventures.